Some lingering snow still butters the streets and sidewalks of Montreal but the thaw is well underway. Another figurative thaw is also underway in China and this past weekend a parade of mainly Chinese Montrealers marched those slushy streets to celebrate it. They marched to mark 200 million Chinese people withdrawing from the Chinese Communist Party (CCP) and its affiliated youth organs, the Young Pioneers of China (for children aged 6-14) and the Communist Youth League of China (for those aged 14-28). The parade wound through Montreal’s Chinatown to mark what has otherwise been a largely silent movement to dissolve the CCP. Some of the spectators waved, some looked questioningly at the scene unfolding, not quite sure what to make of what has become known as “Tuidang,” or Quit the Party, movement. It all began with the Chinese edition of the Epoch Times in 2004, with an editorial series called “Nine Commentaries on the Chinese Communist Party,” a historical recounting of the nature of the CCP and its crimes against the Chinese people. The award-winning series deconstructs the CCP’s propaganda and puts its self-proclaimed glories within the context of its actual history of violence, deception, extreme political repression, and systematic destruction of traditional culture and values. It documents how the CCP has caused the deaths of 60–80 million Chinese people through wars, famine, tyranny, and massacre, and led to a tragic collapse of social and ecological systems in China and a corruption of ancient Chinese culture, overturning the principles and beliefs that have sustained human moral standards for 5,000 years. Absolving oneself of this guilt by association is the impetus for the Tuidang movement. “We love China, love the rich Chinese culture with 5,000 years of history. We love the Chinese people as well. We just want to stop the persecution, stop the CCP doing evil,” Yvan Pinard, one of the event organizers, told the crowd. Volunteers help organize the Tuidang movement’s renunciation centres, online or in on-the-street places where Chinese people can register their withdrawal from the CCP and its affiliated organizations. The Montreal parade was one of dozens held around the world, a commemoration for the victims of the Chinese Communist Party and an act of solidarity and support for those who have withdrawn from its ranks. In China, it is compulsory for all young school children to wear the red scarf of the Young Pioneers. It is red, stained with the blood of revolutionary martyrs. Few children consider deeply the oath they must take: to love the Party and serve the cause of communism. When they get older, it becomes more clear. For those 14 years old and above, joining the Communist Youth League can be a path to career opportunity and position, and joining it is optional. For those who try to join the Party as adults, it becomes a lifelong commitment. Leaving the Party can be awkward, even dangerous. To enter, one must pledge his or her life to the Party and forever fight for communism, willing to sacrifice everything for the Party. To be a member is to carry its burden, however, including its crimes and its debts to the Chinese people and the millions dead and damaged by its reign. Absolving oneself of this guilt by association is the impetus for the Tuidang movement. Speaking in Chinese, Yang Dongdong, who is responsible for a Tuidang centre in Montreal, said Chinese people today understand more clearly the history of the CCP and its real character. “Chinese people have received a clearer understanding of the CCP, a deep understanding of its tyranny and its lies. Considering the status quo with China, the fake merchandise, toxic foods, haze/pollution, the Chinese people began to reflect, fundamentally recognize [the evil nature of the CCP], so quitting the CCP is very natural for many Chinese people,” she said. 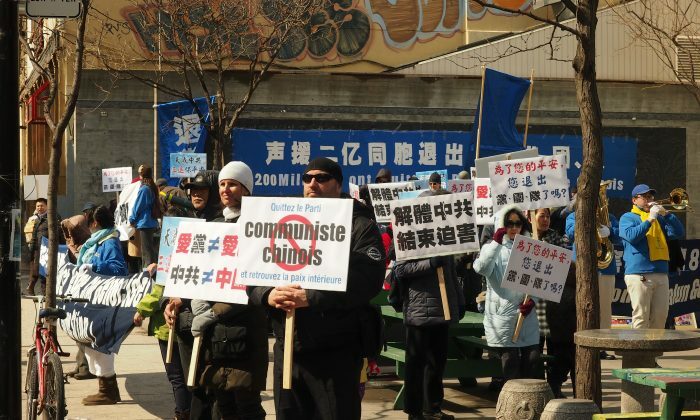 She said Montreal’s Quitting the CCP Service Centre often gets phone calls from Chinese people moving to Canada who want to register their withdrawal, something they could not do while in China. They frequently register renunciations for family members as well, she said. “There are so many people who have resigned their membership with the CCP, one can feel the change,” she said. Many Chinese people confuse patriotism for their country with loyalty to the CCP, she said. “After reading the ‘Nine Commentaries,’ which fundamentally reveals the nature of the CCP step by step, removing the fog from people’s minds, it inspires them to reflect,” she said.